The Survey Calendar feature allows the Survey Administrator to better manage the surveys that are planned and conducted for their particular organization. 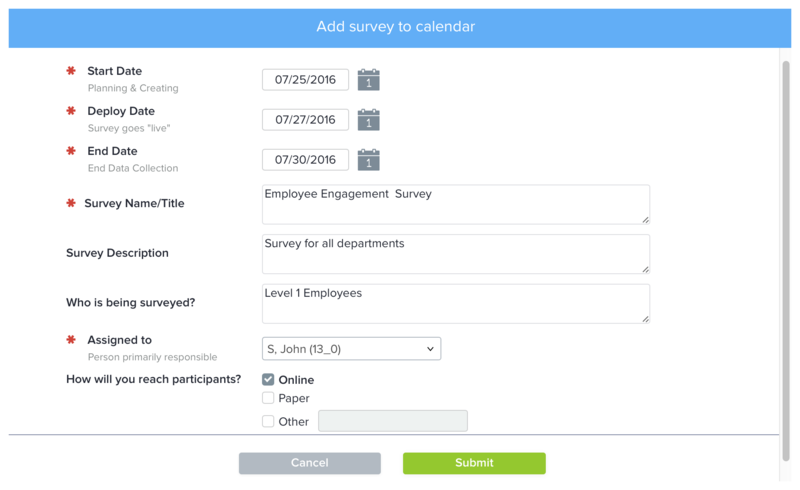 This feature is beneficial to assist organizations manage all surveys that are part of ongoing and newly developed initiatives. Utilizing the Planned and Actual Calendars, the Survey Administrator has the opportunity to view how well the organization is on track with the survey strategic plan that was developed. Click on the Utilities icon in the top right-hand corner of your screen. Click on the Survey Calendar icon. A list of planned surveys will be displayed. Click on the Add Survey button. A new interface will appear requesting survey details. Enter the required information and click the Submit button to add this survey to the planned calendar. To modify a survey in the planned calendar, select the survey to be modified and click the Modify button. After adding the necessary updates, click Submit. To delete a survey from the planned calendar, select the check box to the left of the survey title to be deleted and click Delete button. A message saying “Are you sure you want to delete the planned survey?” will appear. Click OK. Select the survey to be linked from Planned Calendar and click on the ‘Link to Actual Calendar’ button. A window will appear. Select the survey from actual calendar to which you want to link the planned survey and click Submit. Once this linking is done you can view the details of this survey under the Planned Calendar by clicking the Show Details button. In order to export the details of these surveys, click the Export to Excel button. To view surveys that are planned within a specific timeframe, click on the Filter icon towards the top right, enter dates in the available date fields and click the ‘Apply’ button. Click on the Survey Calendar icon. On the Survey Calendar interface, click on Actual Calendar. You may review the list of the active and expired surveys, including their Deploy Date, End Date, Survey Owner and Survey Details. If you wish to export details of the Actual Calendar, click ‘Export to Excel’.